You are here: Home / Shaving / What Is The Best Double Edge Razor In 2019’s Changing Market? “What is the best double edge safety razor?” I get the question all the time. There’s not an easy answer–and lately the market is growing, changing and offering more choices than ever before. This is a major update to a previous set of articles on Sharpologist! Multi-blade, pivoted cartridge razors that come from a few large multi-national companies are manufactured to a narrow set of specifications. Double-edge (DE) razors (and blades!) have a number of options to choose from. Lets look at some of the variables and see what stands out. I’m listing the most popular razors that many people say may be “best” double edge razor in a particular category, and this article is especially aimed at the newcomer to this type of shaving. These are not the only products of course. If you know of a good DE razor not listed here be sure to mention it in a comment! All the prices in this article are in U.S. dollars and approximate. Amazon and West Coast Shaving links are affiliate. Probably the most obvious variable is going to be price–there’s no sense looking for something you can’t afford. I have seen new DE razor prices range from $1 to well over $400. Prices for many popular double edge razors had generally been dropping over the past few years. But there has been a recent “reset.” The low end of the market is being flooded with razors from the Pakistan and China. Many of these razors have dubious quality control. And some brands simply purchase these razors, add their own logo and resell them at a substantial mark-up. On the other hand, the high end of the market is expanding with a number of new, artisan-made razors. But I’m not sure the supply matches the demand.
. Many of the lower-cost Maggard razors are also well-regarded. I think the $20-$30 (and even higher) range is a bit of a wonky market right now. There are a lot of cheap, Pakastani- or Chinese-made razors being purchased by those trying to take advantage of the market and marking the price-point way up. It’s not true of every razor, mind you, but this range is seeing more than its share of sketchy marketers, especially on Amazon. Muhle, and Parker razors. Some of the up-and-coming names that are getting more well-known for this price range include Fatip, Standard, RazoRock, Phoenix Artisan Accoutrements, and iKon. (differing only in the type of handle offered: the “lbl” handle variant appears to be the most popular but there are a wide variety of handle styles). These razors remain popular even with all the changes in the market over the past couple of years. Above this price point is where you will find razors that are popular for reasons other than (or in addition to) performance. 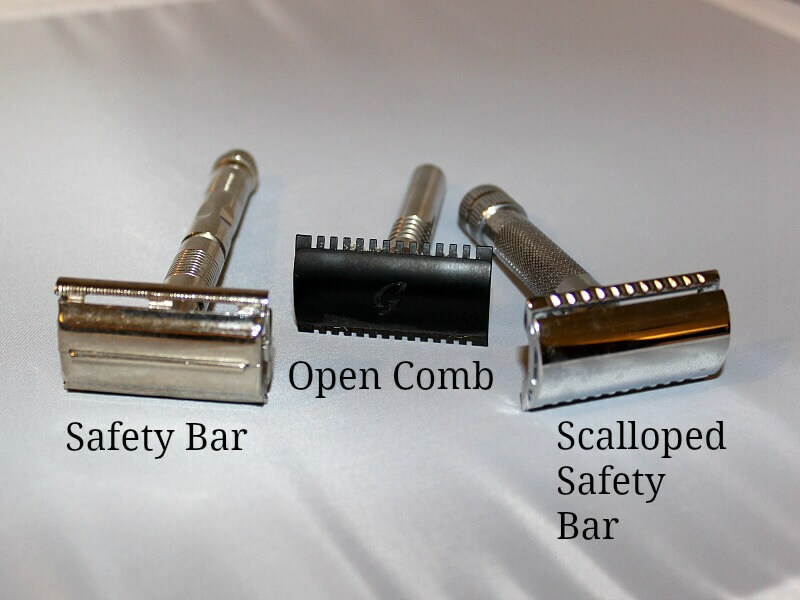 Different head styles (such as “slant” razors as discussed below), special features (including adjustable razors), and razors designed specifically for travel situations are examples of this category. At the high end of the range ($100+, often $200+) you will find the “premium” razors. Not too many years ago the Feather AS-D2 All Stainless Steel razor was considered the high-end double edge razor. Now it’s practically “bargain basement” (for its class): the past couple of years have seen an explosion of artisan-made, luxury-priced razors with premium materials (like stainless steel or titanium) and special handle designs. Some of the names often associated with excellent premium-priced razors include (in no particular order) Wolfman, Timeless, Charcoal Goods, Raw Shaving, Blackland, Karve, and Above The Tie. 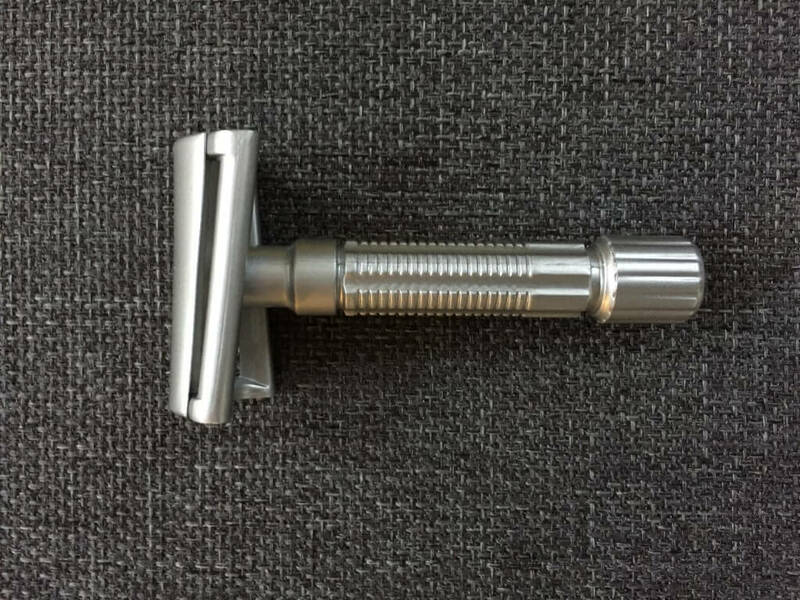 RazoRock is producing a stainless steel razor (the “Game Changer”) at a break-through price point. The next factor for finding the “best” double edge razor is whether it is new, used, or vintage. A new razor is just that: in production, for sale, and not previously used. A used razor is one that is currently in production but has been used before. A vintage razor is one that is out of production (both used and NOS–“new old stock”). The previous section described popular new razors. You can get used versions of many of these same razors for probably around 75% of their new price–they generally hold their value pretty well. Resale prices for some artisan-made, premium razors can be insanely high–often multiples of the razor’s original price. Vintage prices can be “all over the road” depending on condition and the seller’s knowledge (or lack of knowledge). There are a number of sources for used or vintage razors, including local antique stores and flea markets (though availability at these places has dropped in recent years), internet auction sites, and buy/sell/trade (B/S/T) sections of the internet shaving forums. Maybe even a forgotten razor in an older relative’s bathroom? Local stores have the advantage of having something you can see and feel–you are more likely to know to what you are getting. ” by offering a razor at little or no cost to a new shaver, a member of the armed forces, or for some other reason. 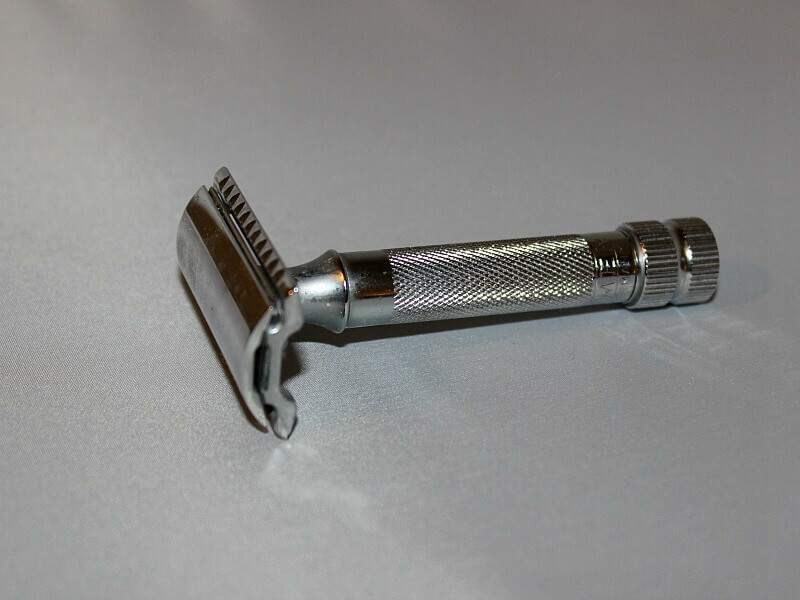 Two excellent “vintage” DE razors include various versions of the Gillette SuperSpeed, and the Schick Krona–see How To Buy A Vintage Razor From Ebay for more information on what to look for when buying a vintage razor. Double edge razors have heads that can be divided into two general groups: Open Comb and Safety Bar. Open Comb’s have obvious “teeth” that help guide heavy stubble and shaving cream into channels. Safety Bars have a solid (or scalloped) bar that provides some additional protection to the skin from the blade’s edge. 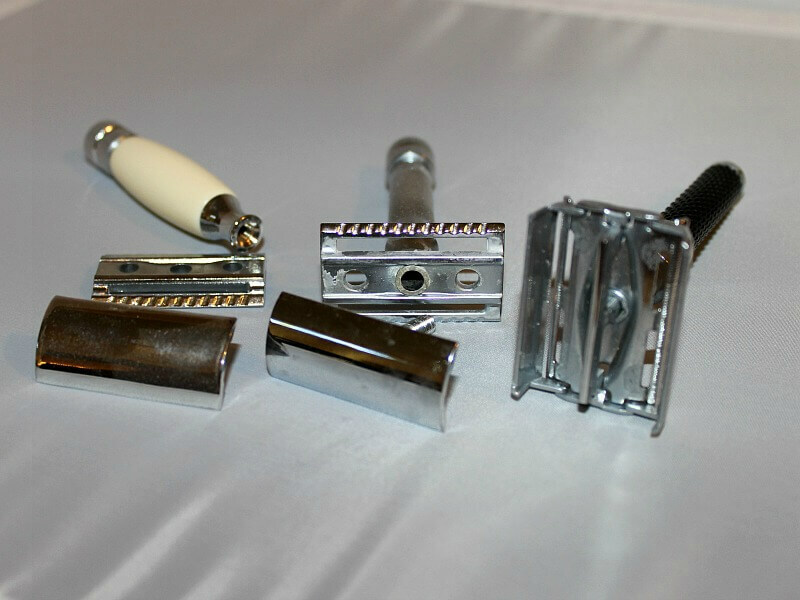 DE razors are typically constructed in one of three ways. Three piece are the classic” (and easiest to manufacture) type, consisting of a handle, a base plate, and a head or cap. 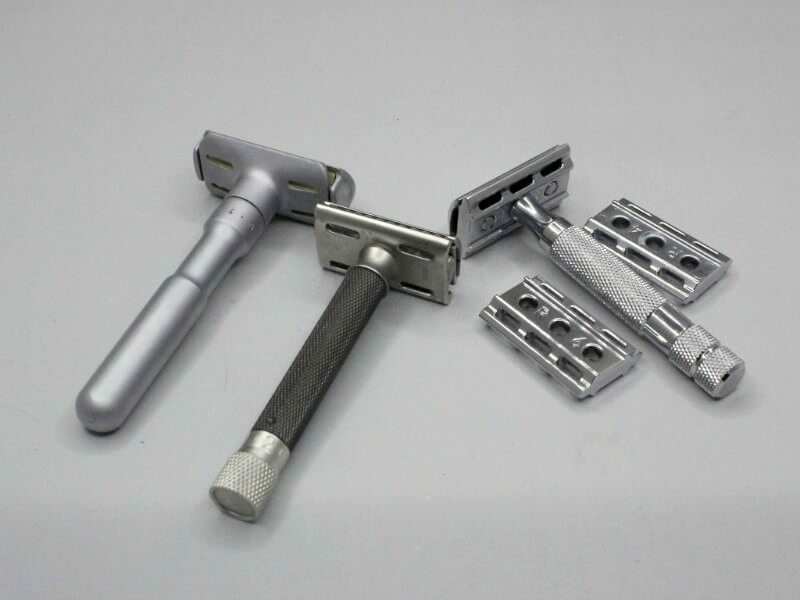 An advantage of a three piece design is that you can sometimes “mix and match” the three pieces from different manufacturers, creating entirely new razors (you’ll sometimes see this referred to as a “frankenrazor” after Frankenstein’s monster). Two piece have the base plate permanently mounted to the handle. A one piece “twist to open” (TTO) razor is the type most common just before the ascent of modern cartridge razors: the Gillette SuperSpeed is the classic TTO. The vast majority of razors have a set gap size, the distance between the razor blade’s edge and the razor’s skin safety bar: the amount of the gap distance is determined by the manufacturer for a particular model of razor. Generally speaking, Open Comb razors expose more of the blade to the skin, making for a more “aggressive” shave. But even razors with a safety bar can be aggressive: it’s all about the amount of blade exposed to the skin. However “adjustable” razors can change the gap to make them more gentle or more aggressive. There used to be few fully adjustable razors currently made, primarily from Parker and Merkur, but others (such as the Rex Ambassador) have recently entered the market. There are also some vintage adjustable razors. A variation of the adjustable razor design is the use of multiple base plates. The Rockwell 6S was the first modern double edge razor to popularize this feature. These razors are not “adjustable” in the normal, continuously-adjustable sense, but rather they offer different base plates: each plate has a different amount of blade exposure set. Other manufacturers are picking up on this theme (including premium razors artisans like Karve), offering different base plate options with some razors. What is a slant razor? Think of it like a mini-guillotine for stubble. Held at an asymmetrical blade exposure by design, the slant is meant to offer a more efficient cutting angle for a DE blade which can give a closer shave more quickly. The design has been around for at least 70 years, but as the DE razor lost popularity beginning in the 1970’s, most slants also vanished from the market. This niche’ was beginning to re-assert itself a couple years ago, but the demand for them apparently did not justify continued artisan interest and there are fewer options available today. Razor’s over-all value (quality vs. price). Remember the old adage, “Your Mileage May Vary!” I was not paid by any manufacturer for these recommendations. What Is The Best Double Edge Razor? Best Low Cost Razor: Dorco PL-602 (plastic) – Honorable Mentions: Maggard MR1, Weishi Nostalgic (long handle), RazoRock DE1. (differing only in handle design. Both shave very well and are not overly-aggressive). Best Adjustable Razor: Rex Ambassador. Honorable Mentions: Parker Variant, Merkur Progress, Weishi Nostalgic Adjustable. Special mention: the Rockwell 6S with base plate set. Best “Slant” Style Razor: Merkur 37C (or Merkur 39C long-handle slant). Honorable mention: Italian Barber RazoRock German 37 Slant (head only). Best Razor For Travel: Merkur Travel Razor. Honorable Mention: Parker Travel Razor A1R. Best “Price Is No Object” Razor: currently OPEN–there are so many excellent, artisan-made razors that it’s hard to pick “the best.” Your comments/suggestions welcome! Stay tuned for an update. Honorable Mention: Feather AS-D2 All Stainless Steel. No discussion about the best double edge razor would be complete without mentioning blades. Many beginners think “a blade is a blade” and while DE blades may all look similar there can actually be fairly significant differences in the way a blade is made. Metallurgy (the metal or combination of metals used to make the blade), coatings, and grinding specifications (the blade’s “sharpness”) can all play a part in the production process. So take the time to try a number of different blade brands to find the one(s) that work best for the razor you’re using (your skin, the mineral content of the water you’re using, and the shave lather you’re using play parts too). Even if you are already using a DE razor you may need to do some additional blade experimentation if you buy another DE. 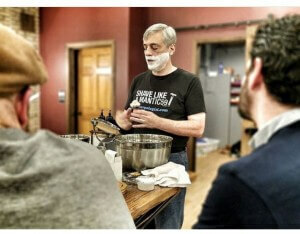 ” to make the process easier: you get a few blades of many different types. After you decide which one(s) work best you can then buy your favorites in bulk, saving a ton of money! Shaving with a DE razor — even the best double edge razor — is not quite like shaving with a modern pivoted cartridge razor: you can’t just take mindless swipes at your face and expect a good shave. You have to learn a new skill set (and possibly unlearn some bad habits) to use a DE razor properly. It’s not a terribly difficult skill to pick up but there is a learning curve. And like learning to ride a bike or play a musical instrument some will pick it up more quickly than others. Luckily, I have a few videos to help you out! What Is The Best Safety Razor For Beginners?